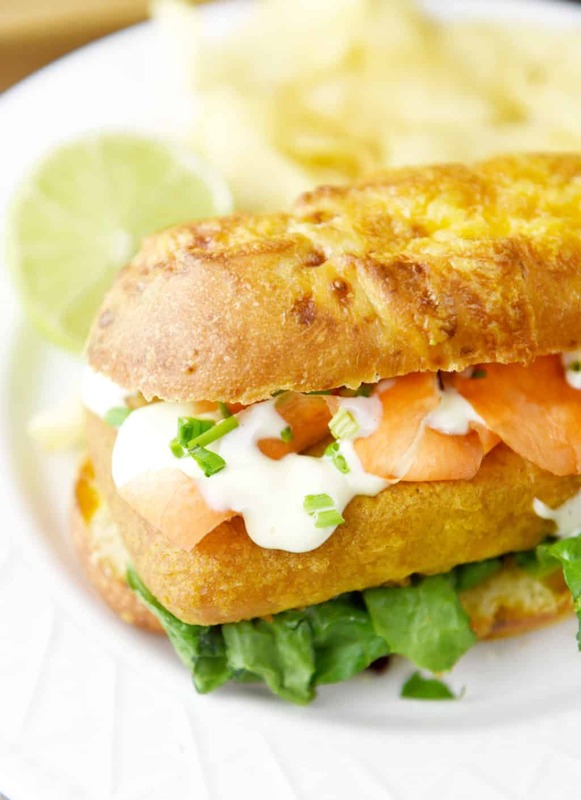 This crispy Pub-Style Beer Battered Cod Sandwich with Garlic Lime Sauce is loaded with flavor! I love fresh fish and seafood, but living in the midwest means that we don’t have access to much of it. Sometimes I will splurge and get some fresh fish here (which comes at a hefty price), but I’ve found that some of the freshest tasting fish is actually frozen! I really love the all new Gorton’s Gourmet Fillets because they taste so delicious. 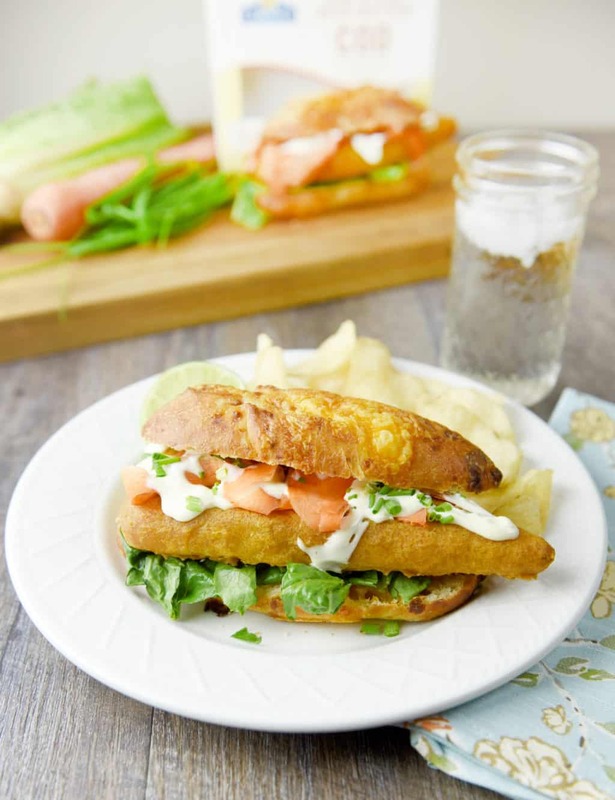 This Pub-Style Beer Battered Cod Sandwich is great for lunch or dinner and tastes amazing with the Garlic Lime Sauce! I think you will love these fillets as much as we do and this sandwich is definitely a must make! 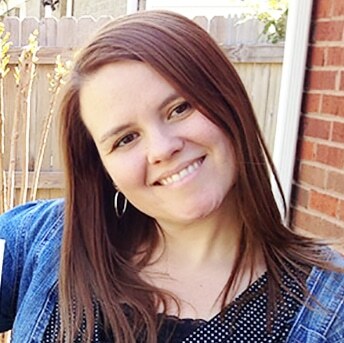 My hubby and I actually ate this sandwich instead of dining out on our last date together… it was THAT good! 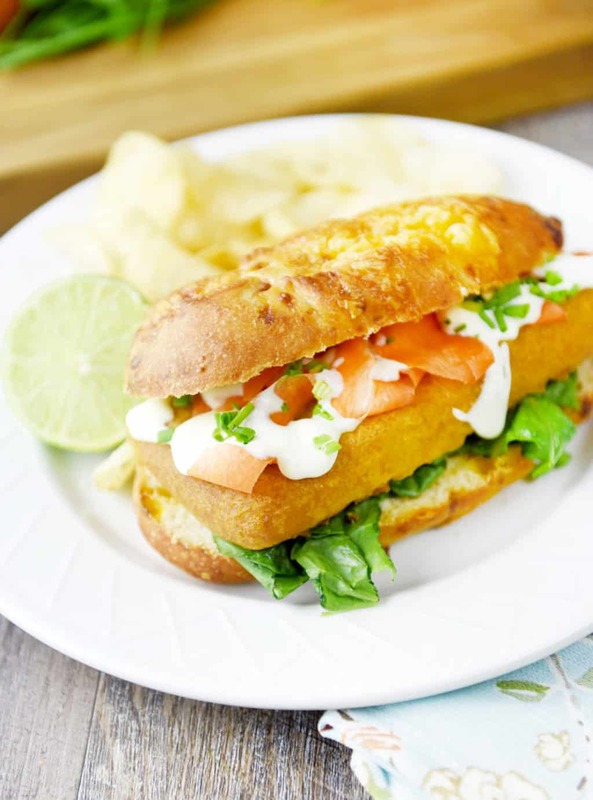 This Pub-Style Beer Battered Cod Sandwich is great for lunch or dinner and tastes amazing with the Garlic Lime Sauce! Mix the ingredients for the Garlic Lime sauce together first. Assemble sandwiches with lettuce on the bottom then fish, carrots, sauce and chives. Enjoy! It’s common knowledge that seafood is good for you and there are multiple reasons why. Seafood contains natural omega-3 fatty acids, lean protein, and critical vitamins and minerals that can aid brain development, promote heart health, help fight obesity, improve arthritis and joint pain and improve overall health. It’s no wonder the USDA, American Heart Association, American Cancer Society, and American Diabetes Association all recommend eating seafood at least twice a week. 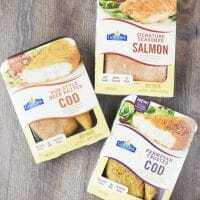 I recently picked up these varieties of Gorton’s all new Gourmet Fillets. Gorton’s makes it easy to serve delicious seafood with a variety of products to please every palate, including all new Gourmet Fillets. Available in Parmesan Crusted Cod, Pub-Style Beer Batter Cod, Tuscan Garlic & Herb Tilapia and Signature Seasoned Salmon, Gourmet Fillets make a great seafood selection. I love the large size of these fillets which are perfect for a sandwich! 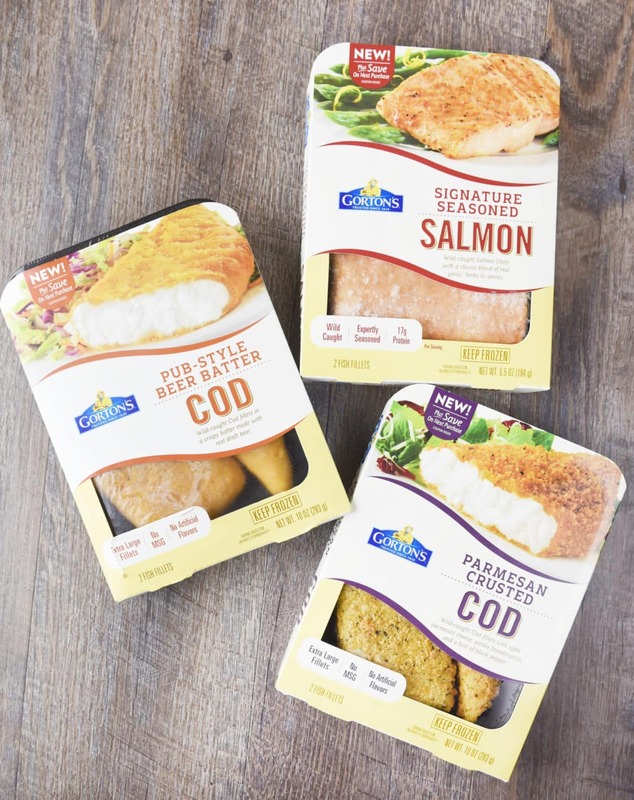 All four chef-inspired varieties of these extra-large fillets are made with real ingredients like roasted garlic, parmesan, butter and oregano and have no artificial flavors of MSG. What’s more, Gourmet Fillets are easy to prepare, leaving you time to make delicious, nutritious side dishes to accompany your seafood. GoGortons.com has recipes for seasonal side dishes, simple salads and more that will make for a convenient meal that’s easy and delicious any night of the week.